A regular permanent resident; the Sharp-tailed Grouse was an uncommon species during the Minnesota Breeding Bird Atlas (MNBBA). The Sharp-tailed Grouse is primarily distributed in the northern Great Plains. Its distribution spans from Nebraska and Colorado north to Saskatchewan and Alberta, west to Montana, and east to Michigan and Ontario. The highest densities are found in eastern Montana (Figure 1). Assigned a Continental Concern Score of 10/20 by Partners in Flight, designated a Species in Greatest Conservation Need by the Minnesota Department of Natural Resources. Grains, seeds, buds, foliage, fruit, and insects, especially grasshoppers; variable depending on season and availability. A sparsely-lined depression on the ground, usually concealed with overhanging vegetation. Breeding distribution and relative abundance of the Sharp-tailed Grouse in North America based on the federal Breeding Bird Survey, 2011–2015 (Sauer et al. 2017). The Sharp-tailed Grouse is the only indigenous prairie grouse in Minnesota (Roberts 1932; Berg 1997). Historically, there were 6 known subspecies in North America, and the Minnesota subspecies had been designated the “prairie race” (Tympanuchus phasianellus campestris) (Hoffman and Thomas 2007). However, recent genetic evidence suggests that many of the original subspecies have been found to be similar with, for example, little differentiation between the sharptails of the Great Plains (T. p. jamesi) and Minnesota’s, T. p. campestris (Spaulding et al. 2006). Berg (1997) emphasizes that even though it is called the prairie race, the species occupies grass, brush, savanna, and boreal peatlands in Minnesota. Roberts (1932) described its historical distribution as “the prairies in the summer and … the brush-lands and open forests in the winter, and the early explorers and first settlers found it abundant everywhere.” In his summary of the species in Minnesota, Berg (1997) described its pre-settlement range in Minnesota as “occupied” throughout the state with the exception of western Minnesota, primarily from Pipestone County in the south to Wilkin and Otter Tail Counties in the north. In the 1930s, Roberts emphasized that the “Prairie Sharp-tailed Grouse” (as it was formerly known) was “now confined largely to the northern part of the state from Pine County northward and westward in cut-over lands, in natural openings, and in brush areas, to the settled prairies of the west-central counties and the Red River Valley.” This is largely the same area still occupied by the Sharp-tailed Grouse today, though the population has declined even more within this range. Roberts (1932) documented confirmed nests with eggs in the Pembina Valley on the Red River in 1873 and in Polk County in 1918 and 1920. Since the heading by Roberts’s account was labeled “Minnesota Nesting,” the Pembina valley breeding activity is assumed to be in Minnesota and not North Dakota. In 1975, Green and Janssen emphasized the Sharp-tailed Grouse’s distribution as primarily in the northern regions and most numerous in the northwestern part of the state in Beltrami, Lake of the Woods, Marshall, and Roseau Counties. Both Roberts (1932) and Green and Janssen (1975) described its distribution as changed after prairies began to be converted to agricultural land and then colonized by the Greater Prairie Chicken. The Sharp-tailed Grouse retreated to the north. Green and Janssen described confirmed nesting in Aitkin, Lake of the Woods, Pine, Polk, and Roseau Counties, plus a 1942 nesting in Swift County in the west-central part of the state. Janssen (1987) reinforced a distribution similar to that of Green and Janssen (1975) and noted that the Sharp-tailed Grouse had been recorded in 1968 in Cook County in extreme northeastern Minnesota. He suggested these were “vagrants” from a population in Thunder Bay, Ontario. Janssen documented confirmed nesting in 5 counties since 1970, including Aitkin, Beltrami, Lake of the Woods, Marshall, and Polk. A few years later, Hertzel and Janssen (1998) would add 3 more counties with confirmed nesting since 1970: Kittson, Pennington, and Roseau. Berg (1997) summarized the breeding distribution of the Sharp-tailed Grouse in Minnesota as two disjunct populations. One population was highly associated with the Agassiz glacial lake bed in northwest Minnesota and the second with a combination of Aitkin, St. Croix, and Upham glacial lake beds in east-central and northeastern Minnesota. The latter also included the taconite ore tailing basins associated with iron mining operations. The Minnesota Biological Survey (MBS) recorded 55 breeding season locations during its counts, which began in the late 1980s (Minnesota Department of Natural Resources 2017a). These locations are largely consistent with the two disjunct populations identified by Berg (1997). One population in northwest Minnesota had the most locations in Clearwater, Kittson, Marshall, Pennington, Polk, Red Lake, and Roseau Counties. The other population was more sparsely distributed and included locations in Aitkin, Carlton, northeastern Kanabec, and St. Louis Counties. Note that the MBS had not yet surveyed northern Beltrami, Koochiching, or Lake of the Woods Counties. The participants in the MNBBA reported 566 records for the Sharp-tailed Grouse and reinforced the identification of two disjunct populations in the state (Figure 2). The species was found in 6.9% (337/4,857) of the surveyed blocks and in 5.4% (127/2,337) of the priority blocks (Figure 3; Table 1). A total of 16 confirmed nests were reported and probable nesting was included from 253 blocks. A total of 7 counties had confirmed nesting records, with new county records for Red Lake and St. Louis Counties, the latter in the former Iron Range mining lands. The distribution of the MNBBA records illustrated a triangular area of northwestern Minnesota from Norman County to Koochiching County to Kittson County. The northeastern and east-central population in Minnesota included Aitkin, Carlton, Itasca, Kanabec, Pine, and St. Louis Counties. Several additional probable nesting observations were recorded from Big Stone, Lac qui Parle, and Chippewa Counties as well as possible records from Pope County in west-central Minnesota. No observations were recorded from Cook County, where possible vagrants from a Thunder Bay, Canada population had previously been observed, nor from Swift County in western Minnesota, where a nest was found in 1942. The latter, however, is near the possible nesting records in the western Minnesota counties such as the records in Pope County. Berg (1997) had previously identified the regions including Lac qui Parle, Pope, and Swift Counties as not occupied during pre-settlement times. Berg (1997) emphasized that the species occupied less than one-third of its historic range in Minnesota. Similar retractions of the species’ range were described by Berg (1990) in Wisconsin and in Michigan. The Wisconsin breeding bird atlas from 1995–2000 included 53 records of the Sharp-tailed Grouse (Cutright et al. 2006). The authors emphasized that the populations are still a fraction of what they were historically. Michigan recorded a slight increase in confirmed nesting of the Sharp-tailed Grouse from 13 townships during its 2002–2008 breeding bird atlas, compared with 12 townships from its first atlas in 1983–1988 (Chartier et al 2013). They emphasized the species’ range is still considerably smaller than during pre-settlement times. In their review of the Sharp-tailed Grouse in North America, Connelly et al. (1998) stated that the species originally occupied 21 states and 8 Canadian provinces. They identified extirpations of the species from the early 1900s to 1970 from California, Illinois, Iowa, Kansas, Nevada, New Mexico, and Oregon. The species’ distribution has also been greatly reduced in the southern regions of its range as well as in British Columbia, Colorado, and Utah. The primary reasons given by Connelly et al. were the conversion of native ranges to agricultural fields and habitat loss. Breeding distribution of the Sharp-tailed Grouse in Minnesota based on the Breeding Bird Atlas (2009 – 2013). Summary statistics of observations by breeding status category for the Sharp-tailed Grouse in Minnesota based on all blocks (each 5 km x 5 km) surveyed during the Breeding Bird Atlas (2009-2013). Summary statistics for the Sharp-tailed Grouse observations by breeding status category for all blocks and priority blocks (each 5 km x 5 km) surveyed during the Minnesota Breeding Bird Atlas (2009-2013). The haunts of the Sharp-tailed Grouse are broadly described as grasslands, brushlands, savannas, barrens, parklands, open and shrubby peatlands, cut-over and burned-over areas, and large disturbed open areas such as from mining operations (Roberts 1932; Hansen 1953; Berg 1990, 1997; Niemi and Hanowski 1992). The species is typically found in large, contiguous open areas in these habitat types (Figure 4). Niemuth and Boyce (2000) suggested that aggregating clear-cuts over a large area can provide suitable habitat. As trees begin to grow in open habitats, the species abandon the area as breeding habitat. The Sharp-tailed Grouse uses brush, riparian and forested habitats for cover during winter (Connelly et al. 1998). Because the grouse is a lekking species, the habitat and landscape context of these sites are also important. Lek sites have been described as occurring on a slightly elevated knoll and characterized by low, sparse vegetation with limited woody cover within 800 m of the lek site (Connelly et al. 1998). Prose (1987) stated that females require appropriate grassy, brush, or woody vegetation within 3.2 km of the lek site. Johnsgaard (1983) suggested that shrub cover is important during the early brood stages. Hanowski et al. (2000) quantified the landscapes surrounding occupied and unoccupied lek sites in the species’ east-central range of Minnesota. They found that active lek sites had more bare ground, emergent aquatic vegetation, and shrubby bogs than random sites. They emphasized the importance of the landscape context (e.g., 3000 m radius) surrounding lek sites and the negative effects of woody cover, especially trees, in the horizon around these sites. A predictive model estimated that about 8% of the species’ east-central range in Minnesota had appropriate lek habitat. Berg (1997) summarized that an optimum mix for nesting and brood habitat included 35% grass-legumes, 15% cropland, 7% sedge marsh, 25% lowland brush, and 13% young aspen and white birch. Svedarsky (1977) also suggested that grassy roadsides in northwest Minnesota could provide suitable nesting habitat for the Sharp-tailed Grouse. The Minnesota Department of Natural Resources has recently initiated a series of experiments on the differential effects of prescribed fire and mowing on the Sharp-tailed Grouse within its two primary ranges in Minnesota (Roy and Shartell 2017). The response is anticipated to be measured for 5–10 years to detect Sharp-tailed Grouse responses to these management treatments. In another experiment, Roy et al. (2017) used genetic analysis to assess the movements of the Sharp-tailed Grouse in fragmented landscapes of Minnesota to assess potential barriers among suitable habitats. Typical breeding habitat of the Sharp-tailed Grouse (© Gerald J. Niemi). Partners in Flight estimated a population of 750,000 breeding adults in the United States and Canada (Partners in Flight 2017). The Minnesota population was estimated as 7,000 individuals. The estimated hunter harvest in Minnesota has ranged from 7,130 to 16,820 from 2004–2005 to 2016–2017, with an estimated take of 8,610 in 2016–2017 (Dexter 2017). Hence, the Partners in Flight (2017) estimate is likely a substantial underestimate. North Dakota estimated a population of 170,000 adults (Dyke et al. 2015). The MNBBA did not sufficiently detect the species on its point counts and therefore did not provide an estimate. Environment Canada (2011) estimated the Sharp-tailed Grouse population as ranging from 50,000 to 500,000 adults, with a moderate decrease since 1970. 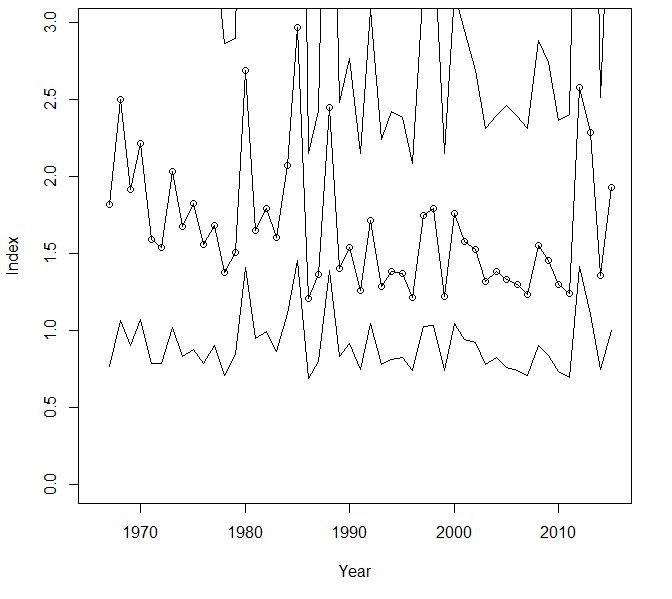 Trend estimates from the federal Breeding Bird Survey (BBS) were unreliable for Minnesota and survey-wide. Population trend estimates were reliable for the Badlands and Prairies BBS region that includes the species’ primary breeding range in the Dakotas and eastern Montana (Figure 1). The estimated trend in this region was stable from 1966 to 2015 but also highly variable (Figure 5). The species’ BBS trend in North Dakota was also credible and stable over the same time frame. Partners in Flight suggested a 19% increase in the population from 1970 to 2014 based on the BBS data (Partners in Flight 2017). The Sharp-tailed Grouse is estimated to be the third most abundant upland game bird in Minnesota, behind the Ruffed Grouse and the Ring-necked Pheasant (Berg 1997). Few attempts have been made to estimate its population in Minnesota; hunter harvests, annual lek counts, and roadside counts have primarily been used as indices of abundance (Berg 1997). Historically, the Sharp-tailed Grouse has been described by early explorers as “abundant everywhere” (Roberts 1932) and “numerous” in their northwestern range (Berg 1997), with flocks “so large that pioneers said they sometimes blocked the sun” (Minnesota Department of Natural Resources 2017b). Berg (1997) described the decline continuing into the 1940s, when mail carrier “surveys in the spring of 1962 found birds in 21 northern counties,” with most having 0.9–2.7 sharptails/100 km of roads in the northwest and 0.1–0.9 sharptails/100 km of roads in the east-central range. By the late 1960s, adult male densities were estimated to exceed 0.2 birds/km2 in only 9 northwestern and 2 east-central counties. Green and Janssen (1975) stated that the Sharp-tailed Grouse reached its lowest population level in the mid-1960s. Berg (1990) illustrated the changes in hunter harvests from 1949 to 1988. In 1949 over 150,000 birds were killed, but in 1965 this total reached a low of fewer than 10,000 birds. This number increased to approximately 50,000 in the late 1970s. Recent estimates illustrated a relatively stable but low population. For example, the estimated harvest from 2001–2002 to 2016–2017 ranged from 1.1 to 2.4 birds harvested per hunter, while the number of hunters ranged from 4,913 to 7,140 (Dexter 2013, 2017). Spring lek count surveys completed from 1980 to 2017 also indicate a relatively stable count of ~ 7 to 13 birds per lek (Roy 2017). From two townships studied in northwest Minnesota from 1964 to 1980, Berg (1997) estimated that the male density of the Sharp-tailed Grouse ranged from 0.3/km2 to 1.5/km2. Breeding population trend for the Sharp-tailed Grouse in the Badlands and Prairies Region for 1966–2015 based on the federal Breeding Bird Survey (Sauer et al 2017). Partners in Flight (Rosenberg et al. 2016) provided a moderate conservation score of 10/20 for the Sharp-tailed Grouse. Even though the species has had a massive decline since the 1800s, the population has stabilized and has recently been estimated to have increased by 19% over the past 45 years. Partners in Flight (Partners in Flight Science Committee 2013) had identified the Sharp-tailed Grouse as a Stewardship Species of regional concern. Dyke et al. (2015) identified the sharptail as a Level II Conservation Priority in North Dakota, primarily because of a historical decline in its population and because an estimated one-third of the entire North American Sharp-tailed Grouse population resides in the state. Environment Canada (2011) considered the species to be secure at present. Berg (1990) described the status of the Sharp-tailed Grouse in Minnesota as perilous because of its massive decline since 1963. The primary causes articulated by many were the loss of appropriate habitat due to vegetation succession of the grassland-brushland ecosystem, improperly placed conifer plantations, intensive agricultural development, and fire suppression (Berg 1997; Connelly et al. 1998; Cutright et al. 2006). As stated under breeding habitat, Sharp-tailed Grouse are area sensitive and found primarily in large expanses of suitable habitat which often requires coordinated management with private landowners and several government agencies. Due to these habitat issues, the species is officially listed as a Species in Greatest Conservation Need (Minnesota Department of Natural Resources 2015). The National Audubon Society (2015; Langham et al. 2015) labeled the Sharp-tailed Grouse as “climate endangered” and predicted a 76% loss of the species’ summer range by 2080 with changes in climate. The Minnesota Department of Natural Resources (Berg 1990) has a Sharp-tailed Grouse management plan that has been hampered by funding and implementation issues. Management of the Sharp-tailed Grouse has also been identified in the Minnesota Prairie Conservation Plan (Minnesota Prairie Plan Working Group 2011). The recent State Wildlife Action Plan (Minnesota Department of Natural Resources 2015) has identified a number of conservation focus areas, such as the Aspen Parklands Section and Glacial Ridge that could benefit the sharptail. The habitat and landscape issues for this species are also shared with many other species found within its habitat complex, including the Yellow Rail, Short-eared Owl, Bobolink, Eastern and Western Meadowlark, Sharp-tailed Sparrow, and many others. Ultimately, the conservation status of the Sharp-tailed Grouse will depend on a commitment of many organizations to large-scale habitat and landscape management of the grassland, brushland, and peatland ecosystems of the state. Berg, William E. 1990. “Sharp-tailed Grouse Management Problems in the Great Lakes States: Does the Sharp-tail Have a Future?” Loon 4: 42–45. Berg, William E. 1997. The Sharp-tailed Grouse in Minnesota. Minnesota Wildlife Report, no. 10. St Paul: Minnesota Department of Natural Resources. Hanowski, JoAnn M., Donald P. Christian, and Gerald J. Niemi. 2000. “Landscape Requirements of Prairie Sharp-tailed Grouse Tympanuchus phasianellus campestris in Minnesota, USA.” Wildlife Biology 6: 257–263. Hanson, Harold C. 1953. “Muskeg as Sharp-tailed Grouse Habitat.” Wilson Bulletin 65: 235–241. Johnsgard, Paul A. 1983. The Grouse of the World. Lincoln: University of Nebraska Press. Niemuth, Neal D., and Mark S. Boyce. 2000. “Enhanced Avian Diversity in Wisconsin Pine Barrens Through Aggregated Timber Harvest: A Simulation.” Transactions of the North American Wildlife and Natural Resources Conference 65: 2015. Prose, Bart L. 1987. Habitat Suitability Index Models: Plains Sharp-tailed Grouse. Biological Report 82(10.142). Washington, DC: U.S. Department of the Interior, Fish and Wildlife Service, National Ecology Center. Spaulding, Allen W., Karen E. Mock, Michael A. Schroeder, and Kenneth I. Warheit. 2006. “Recency, Range Expansion, and Unsorted Lineages: Implications for Interpreting Neutral Genetic Variation in the Sharp-tailed Grouse (Tympanuchus phasianellus).” Molecular Ecology 15: 2317–2332. Svedarsky, W. Daniel. 1977. “Roadside Nesting by Prairie Grouse in Northwest Minnesota.” Prairie Naturalist 9: 41–42.